The development of lasers, and more recently IPL, LHE, and LED systems, has allowed practitioners to treat certain types of vascular (vein) and pigmented (skin colour) lesions more safely and effectively. Different light systems may be used to treat a range of different vascular and pigmented problems including: spider or thread veins, port wine stains, rosacea, spider naevus, age or liver spots, solar keratosis, freckles, pigmented birthmarks, warts, verrucae, some scars and stretch marks. Because of the variety of different skin problems that can be treated with these machines we cannot stress strongly enough how important it is to find a practitioner experienced in treating your particular problem. Treatment costs vary depending on the type and extent of the problem that you have. Prices for minor treatments involving small areas may cost in the region of £100 per session, with intermediate treatments being around £200 - £300 and major treatments £400 or more per session. The Discovery Pico and Pico Plus (PICO SERIES) picosecond laser for tattoo and pigmented lesion removal features a dual-wavelength 532nm frequency doubled Nd:YAG (KTP) laser and a 1064nm Nd:YAG, both capable of picosecond and nanosecond output. PicoWay Picosecond Laser System by Syneron Candela is a dual-wavelength picosecond laser with both fractional and non-fractional capabilities for removing tattoo ink or natural pigment in the skin. The use of light as a medical treatment has grown significantly in recent years. There are now a number of devices which can deliver different types of light for an ever-increasing array of new cosmetic uses. Ultra - Violet light, for example, has been used to treat psoriasis (a skin disease) for a number of years, and many people use light boxes during the winter to reduce the symptoms of seasonal adjustment disorder (SAD). To put it simply, exposure to light, which resembles sunlight, makes people feel better! The use of laser light for medical procedures began in the 1960s when they were first used in operations as cutting tools by some surgeons. Laser technology has developed over the last few decades to treat patients with a variety of different skin problems including the effects of sun damage, removal of body hair and recently the treatment of psoriasis and acne. Lasers are also commonly used by ophthalmologists (eye specialists) for the treatment of certain eye conditions, and there are now numerous private centres advertising the use of lasers as a treatment for short sightedness. The use of lasers by cosmetic clinics has increased dramatically over the last decade. Newly invented laser machines can give you excellent results and without the former complications in recovery and healing. More recently still, is the development of Intense Pulsed Light (IPL) and Light Heat Energy (LHE) systems that can be more flexible in use than some lasers. Figures from the American Society for Aesthetic Plastic Surgery (A.S.A.P.S.) indicate that laser treatment of leg veins was performed just over 61,500 times in the U.S. in 2013, showing a large decrease of 45.5% since 2012. If you are considering this procedure, the following information will give you a basic understanding about what's involved. It can't answer all your questions, since a lot depends on the individual patient and the practitioner. Please ask a practitioner about anything you don't understand. What are lasers and IPL/LHE/LED machines and how do they work? A laser is a high energy beam of light that can precisely transfer this energy into certain tissues within the skin. These beams of light are produced in one wavelength or colour at a time, and can vary in terms of their strength and the type of tissue that they can target. Lasers used on a variety of veins or pigmented (discoloured) skin problems can direct their heat towards a desired target in the skin which results in “damage” to particular tissues. For example, in the case of thread (spider or red) veins, the target is the blood filled vessel that is precisely heated and destroyed by the laser without harming surrounding areas. The process of directing a laser or IPL source to a target area of the skin to damage it is technically known as "selective photothermolysis". Your practitioner may refer to it as this. This is another light technique variation that sends out controlled levels of both low level light and heat. Emits red light used in conjunction with special creams for the treatment of actinic keratosis and blue light for acne treatment. some scars and stretch marks. Some machines have also recently been developed and used for the treatment of acne. What happens during a Laser/IPL Treatment for Pigmented & Vascular Problems? Your first discussion with a practitioner should clearly set out your expectations. This should be matched by the recommended treatment and your practitioner will tell you whether the treatment can achieve the results you require. A medical history should be taken to make sure that there are no reasons why you shouldn’t have this form of treatment. You would also normally be asked to read detailed information and sign a consent form at this time which means that you have understood the potential benefits and risks associated with the light procedure recommended. Depending on the area of skin and type of machine used, different treatment procedures will be individually tailored for you. This procedure generally requires no special treatment beforehand. An anaesthetic cream may be applied 20 minutes or so before treatment to help numb the skin, and you will be required to wear eye protectors for all laser and IPL machines. Depending upon the type of light system used, you may experience a slight stinging sensation when the flash of light is delivered to the treated area. The entire procedure may last 15 minutes to half an hour depending on the type and extent of the skin problem treated. Repeat treatments may be required depending upon the type and extent of the lesion treated. How long will it take to recover from Laser/IPL Treatment for Pigmented & Vascular Problems? Most patients will be able to return to work immediately following these type of procedures. What are the risks and potential complications from Laser/IPL Treatment for Pigmented & Vascular Problems? Depending on the type of light treatment used and what area of your body you are having treated, some mild stinging or burning may be noticed during the procedure, and the area treated may feel hot for 15 minutes or so after treatment. Most patients will experience skin redness over the treated area which will fade over the next hour or so. Sometimes, some mild bleeding may occur with scabs forming afterwards. Post - treatment risks or side effects can include skin discoloration and scaling that usually fades over a period of weeks. Rarely, minor scarring or more permanent pigment changes to the skin may occur. What should you do after Laser/IPL Treatment for Pigmented & Vascular Problems? It is very important that you follow the advice of your practitioner carefully after any laser or IPL treatment for vascular and pigmented problems to help make the procedure as successful as possible and to reduce the risk of complications. Who should not have Laser/IPL Treatment for Pigmented & Vascular Problems? Darker skin, or recently tanned skin, may be not be suitable for treatment by certain types of machine. Your practitioner will advise you about this if you have a darker complexion. Who can perform Laser/IPL Treatment for Pigmented & Vascular Problems? Generally light systems for the treatment of vascular (problems of the veins), skin discolouration and scarring are used by trained doctors, surgeons or nurses. Some manufacturers have also produced machines that can be used safely by trained beauticians or aestheticians for a limited range of vascular or pigmented problems. Is Laser/IPL Treatment for Pigmented & Vascular Problems available on the NHS? Depending upon the type of problem that you have, you may be able to access Laser or IPL Pigmented and Vascular treatment free of charge on the National Health Service. Certain regions do make special cases, and we would always recommend that you visit your General Practitioner before embarking upon a cosmetic procedure for the treatment of any vascular or pigmented skin problem. What is the average cost of Laser/IPL Treatment for Pigmented & Vascular Problems? Treatment costs vary depending on the type of problem that you have, and also the extent of the problem. There may be an initial consultation fee, or fee for a test patch of skin to be evaluated. Prices for minor treatment sessions involving small areas may cost in the region of £100/session, with intermediate treatment sessions being around £200 - £300 and major treatment £400 or more/session. The development of lasers, and more recently IPL, LHE, and LED systems, has allowed practitioners to treat certain types of vascular and pigmented lesions more safely and effectively. Improved machines, which are versatile, safer and cheaper, have encouraged more practitioners to purchase this type of equipment, making them more widely available. This trend is likely to continue as technology develops and more clinics adopt their use. The treatment will certainly improve as more knowledge is learned about the new technology and our skin. Although current results can be very good, they vary both with the skill of the operator and type of machine used. There are still some problems and skin lesions or veins, which have been treated - even using the most up to date technology - will often not disappear completely, although they are usually much less obvious than before treatment. Because of the variety of different skin problems that can be treated with these machines we cannot stress strongly enough how important it is to find a practitioner experienced in treating your particular problem. As some of these systems are available in beauty salons and specialist laser clinics - you must do your homework to make sure that they have the right equipment and training to treat you safely and effectively. 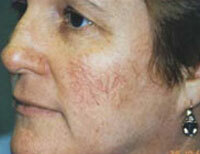 Female with mottled pigmentation due to sundamage and after 4 IPL treatments. 9 year old female with spider angioma and patient 1 month after 1 IPL. Female with varicose and spider veins and 3 months after 2 laser and 3 IPL treatments.. Female with thick port wine stain and patient 2 years after 1 laser and 3 IPL treatments.. Female with pigmented lesion on the cheek and patient 2 months after 2 IPL treatments. 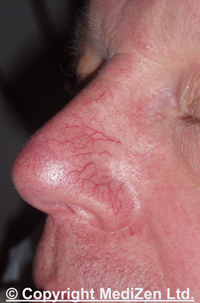 Female with facial thread veins and patient after 3 IPL treatments. Female, 33, with keloid scar (raised scar that grows out beyond the original injury site) on chest. 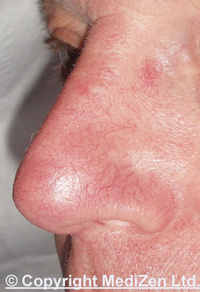 Improvement in patient's scar after 8 IPL treatments. Click for ALL Laser and IPL Treatment Pigmented/Vascular Problems clinics in the UK & Ireland registered and verified by Consulting Room.